Operating from Bray Marina with it's full on-site facilities and tranquil surroundings, Bray Marine Sales Ltd has been one of the busiest and professional middle-Thames Boat Sales operation since it was founded in 1992. We will consider a part exchange or outright purchase against any boat on brokerage, allowing for a clean transaction without the inconvenience of having to own two boats at once. We specialize in cruisers from 22ft to 40ft; we UK Agents for :English Harbour Yachts embody the simple unique pleasures of boating. With only handcrafted, classically influenced, modern boats on offer, they focus on elegance, whilst still delivering seaworthy masterpieces. 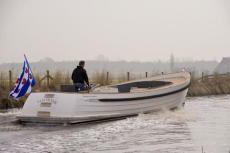 Sheerline motor cruisers from 25ft to 34ft offering bespoke river and coastal cruisers and the well established Dutch yard of Aquanaut giving us a range of 75 different models in total. Timeless masterpiece The exclusive Tendersloop 920 combines the elegance of a classic sloop with the latest standards in the area of design and technology. A timeless masterpiece. The ship is excellently equipped for making quiet tours, but is especially in its element during fast routes where speeds up to 90 km/u are possible. Even with those speeds, the ship remains responsive and leaves the control to the helmsman. 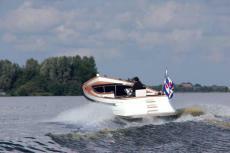 The Waterspoor Tenderloop 920, developed from the basic plan of the 870, is a model of craftsmanship. This is the basis of a new sailing experience in which high performance and sheer luxury of quality and comfort melt together in a subtle design. The powerful design with an authentic and recognizable lines offers passengers an optimal residence comfort in which your personal wishes find expression. Modern theme on a classic design The Waterspoor Tendersloop 870 is a unique combination of a classic motor sloop and a fast tender. The smooth classic lines define the image of a beautiful and comfortable family ship, but under the water-line hides a ultra-modern underwater-ship that is designed specifically to bring the 870 fast and smooth into slide speed. Thanks to the continuous deep skeg, the Tendersloop 870 sails smoothly and at a steady course at low speeds. The name ‘tendersloop’ is well chosen: the 870 combines a fine appearance and sporty performance of a high performance tender. 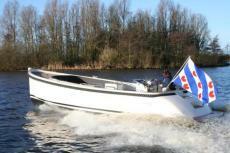 The Tendersloop 870 is a strong polyester ship, that is build by the strict quality standards of Waterspoor Jachtbouw. The sloop is CE category C certified, which means that the 870 is suitable for coastal waters to sail up to wind-force 6and a wave height of two meter. 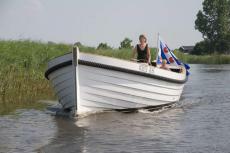 So you can sail on the Ijsselmeer and the Wadden! In addition, the spacious Tendersloop 870 offers equipment options such as sleeping accommodation for two, a toilet, a refrigerator and a small sink, so you can spend the night on the ship if desired. The Waterspoor Tendersloop 870 is much more than just a sloop. It is also a comfortable, fast sailing ‘weekender’. The newest sloop The Waterspoor Tendersloop 808 is Waterspoor Jachtbouw’s newest model, built entirely by the company itself. With the 808, Waterspoor has succeeded in bridging the traditional line to today’s modern design. This classic exterior could leave you with the wrong impression, because this spacious no-nonsense sloop can be built as a ship with high displacement or as a high-speed ship. Seen head on, this ship looks like a classic sloop, but from the rear it has the loop of a tender with a practical passageway to the swimming platform. The layout is designed for comfort, with high backrests and lots of foot room. It is a sloop that gives you a lot of ship for your money. The new Water Rail Tender Loupe 711 OPEN features the popular OPEN mirror conversion which was first introduced on the successful Waterspoor Tender Loupe 808 OPEN . The open transom with access to the swim platform provides additional freedom of movement and comfort on board . 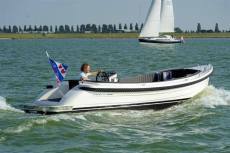 With the arrival of the 711 and 777 OPEN Aviator offers Waterspoor Shipbuilding in conjunction with the Water Rail 808 OPEN excellent range of luxury Tender Barges with sporty lines and a convenient gateway to the swimming platform. Experience the Water Rail Tender Loupe 777 Aviator, the perfect combination of traditional lines , innovation and contemporary design. The Aviator 777 can be carried out as quickly Displacement decisively while the performance is unprecedented. 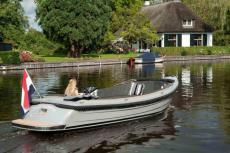 This no-frills boat combines classic lines with a modern mirror tender . The stern features a convenient passage to the swimming platform for more freedom of movement on board. In the bow is a spacious bathroom with the same dimensions as the 808. This space can be closed and therefore offers the necessary privacy on board. Also an ideal place to store the sun pads and other gear on ! Take the helm of the Aviator in hands and you'll have the perfect sailing characteristics and performance of a Tender Loupe experience which you have never experienced before. Elegance & Luxury Luxury isn’t just about beauty and comfort. It also has everything to do with the quality of what you see and experience. The Waterspoor 707 combines the elegance of a classic sloop with the latest standards in the field of design. Waterspoor has developed a special hull form that makes it possible to increase movement speed, which makes the 711 unique in its kind. The 711 also keeps a positive effect on comfort during boating. In practice, this means that the Waterspoor 707 sails smoothly in rough water, but also holds its course while cruising in calm water. Elegance & Luxury Luxury isn’t just about beauty and comfort. It also has everything to do with the quality of what you see and experience. The Waterspoor 707 combines the elegance of a classic ship with the latest standards in the area of design. Waterspoor has developed a special hull form that’s not only seaworthy, but also has a positive effect on comfort during boating. In practice, this means that the Waterspoor 707 sails smoothly in rough water, but also holds its course while cruising in calm water. 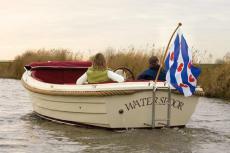 Smart, big and affordable The Waterspoor 630 is compact on the outside and spacious on the inside. With an overall length of 6.30 meter you can always find a place to moor, even though the sloop is big enough to invite five or more people on board. The Waterspoor 630 also offers you the comfort of a small pantry, a large cool box and a flush toilet that is located under the U-shaped couch in the forecastle. Of course, we have thought about your privacy: under the spray hood are provisions that guarantee you a moment for yourself. The pantry is located amidships on the starboard side and consists of a small sink with an electric pump and cooker. The cool box is located on the portside opposite the pantry. In short, this sloop has everything you need for a pleasant day on the water. The Waterspoor 630 meets the strict CE-inspection requirements in category C, which gives the ship a label for sailing in coastal waters. This means that the Waterspoor 630 meets the highest standards, in terms of construction, finishing, sailing characteristics and buoyancy. Waterspoor Jachtbouw has developed a special semi-round bilged hull form which ensures that the Waterspoor 630 sails smoothly in rough water, but also holds its course while cruising in calm water. This hull form makes the 630 very stable, so you can easily get in and out of the sloop. 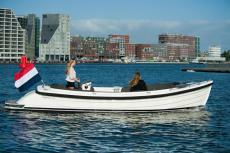 The Waterspoor 630 has different versions and even the most simple version is well equipped. You can compose your future Waterspoor 630 to your wishes with the extensive option list.